This Lennar Homes Florida review comes from a homeowner in Miami and was originally posted on the Better Business Bureau website. The original review was slightly modified for grammar and formatting. 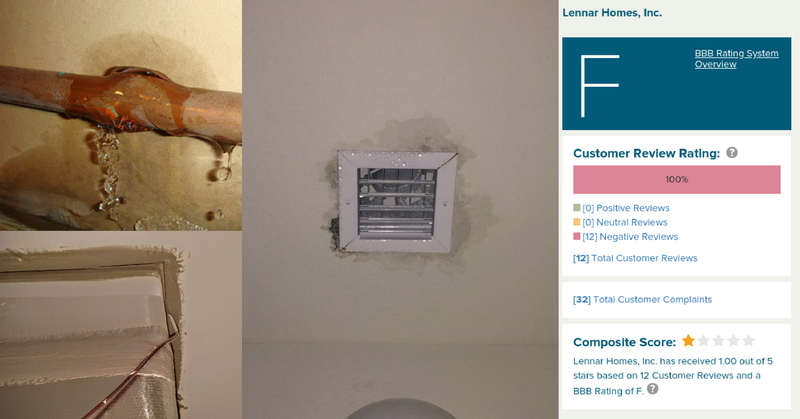 I have included links to similar Lennar construction defects and experiences I have had in my home. “Horrific experience with Lennar, at every level of management. I have sent Lennar Corporate over a dozen emails requesting assistance with failure to address warranty issues with my home. Lennar Corporate’ sub-division is refusing to acknowledge proven construction deficiencies, non-compliance with provisions of the filed and approved Building Plans and Building Code violations. All the lack of quality has been documented by both my engineers and Lennar’s. I have a home with proven water damage and black mold. They built me a home that will continue to degrade based on moisture and will harm my family with future mold. My problem Lennar Corporate is that they have never responded to any of my emails. I have sent the requests directly to Lennar Corporate, media and their legal department. Lennar may claim that my problems are in litigation, however, they are not. Especially during my initial contact (several months ago), they refuse to address the severity of the construction defects and how they build their homes. Ignoring the problem will not solve anything.